This 4-hour tour will begin with an airport or port pickup from Miami or Fort Lauderdale. 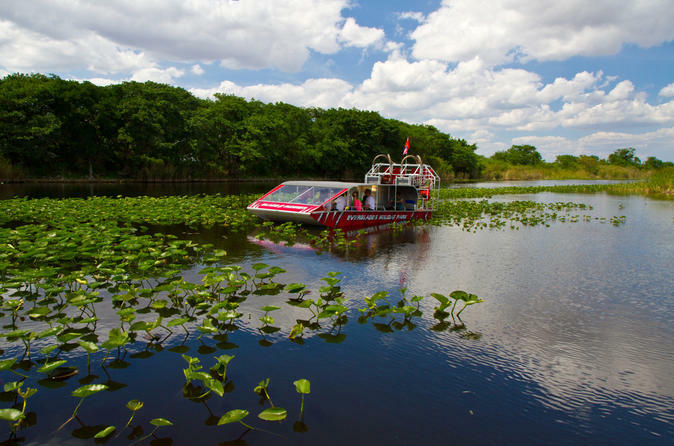 Travel to Everglades National Park and glide across wide-open grasslands on a guided airboat. The experienced captains will travel deep into vast and silent Everglades' jungles to see alligators, exotic birds, iguanas, and turtles in their natural habitat for approximately one hour. After the airboat tour concludes, the excitement continues with a live alligator presentation. The Gator Boys and Girls of the cable channel Animal Planet will perform exciting stunts and tricks and educate about the conservation and preservation of one of the world's most delicate and vital inhabitants. Listen to the alligator's distinctive 'jaw pop' and get ready to take some amazing photos of these animals displaying natural feeding behaviors. At the conclusion of the show, join the staff for a chance to hold a baby alligator. The trip ends with a Miami to Fort Lauderdale drop-off.